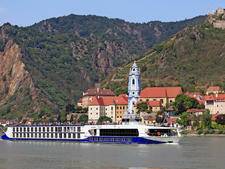 The 140-passenger Jane Austen began life in 2015 -- identical to its sister ship, Lord Byron, which launched in 2013 -- offering Rhine and Danube river cruises as part of Riviera Travel's program of escorted tours. 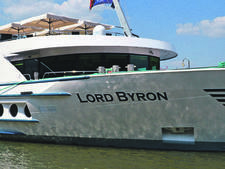 Although Riviera Travel doesn't own the ship -- they long-lease it from owner and river ship builder Scylla AG -- it has been built to the line's specifications, born out of a demand for Riviera Travel to add more river cruise ships and itineraries to its program. The line is rolling out two more river ship offerings in 2017: the identical and brand-new 169-passenger Emily Bronte and Oscar Wilde vessels. Jane Austen's Rhine itineraries have been hugely popular since launching and it's easy to see why, with the particular stretch on our sailing offering plenty of eye candy in the form of castles, vineyards and quaint towns and villages. It's not all about the view, though. Jane Austen is well-suited to its slightly older -- typically 65-plus -- British passengers, offering a no-frills, yet premium-style, river cruise. The line doesn't go for high-tech devices, nor is it big on activities or energetic entertainment. Instead, Jane Austen offers a relaxed atmosphere in a highly comfortable vessel. Our cruise was sold out and we were told that many of 2017's itineraries are already sold out, too. 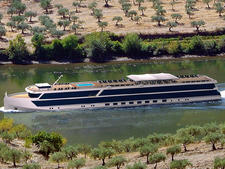 One of Riviera Travel's strengths as an escorted tour operator lies in packaging cruise and land tours. For river cruise passengers, this means well-organized and inclusive travel on the Eurostar from London St Pancras railway station, or flights -- although some flights may carry a supplement -- from a number of regional airports to your embarkation port. Passengers also get a handy pre-cruise travel pack through the mail pre-trip, including luggage tags for your suitcases, cabin tags to write your cabin number on and other information about your itinerary and what to expect when you arrive at your embarkation station or airport. 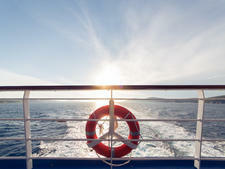 Passengers are met with a warm and friendly air as soon as they step onboard the ship. The space still has that new feel, with lots of shiny surfaces and pristine furniture. The lobby features crystal chandeliers, marble flooring, a wrought-iron staircase and dark wood paneling -- offering a luxury quality to the space that greets passengers. We love the vintage-style cabin-card cubbyholes behind the reception desk, reminiscent of a bygone era of travel -- though we don't think this is intentional -- which adds to the ambiance of the small, but well-laid out lobby. Crew and guest service staff are extremely helpful -- they'll go the extra mile to help you out or find the answer to your question if they don't know it offhand. We also found that crew build a quick rapport with passengers and a friendly air of familiarity quickly develops. On our cruise, our cruise director and tour manager made a good match. They're not only knowledgeable and helpful, but they're passionate about the destination and offered personality with their information and destination talks. 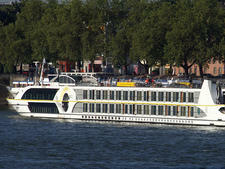 The ship is well proportioned and a good size for the quantity of passengers onboard. Overall, the mood is peaceful and, although not a large ship, you'll easily find a quiet corner to read or take in the passing scenery. Although fellow passengers were friendly on our sailing, we didn't encounter much interaction between groups of passengers onboard. If you're more of an active cruiser, there's a danger you might become restless onboard Jane Austen. There's little to do in the way of activities, enrichment or fitness onboard and shore excursions involve gentle one hour to 90-minute walking tours, though bikes are available if you're keen to explore ports on two wheels. If you're looking for an active river cruise experience or more mental stimulation onboard, this is probably not the river ship for you. If you're happy to read a book and do little else as you sail, you'll enjoy this ship. One last observation: We found no reference to Jane Austen onboard the ship, not even a glimpse of "Pride and Prejudice" in the ship's bookcase, which provides the perfect opportunity to add a subtle nod to the ship's namesake onboard. The ship caters exclusively to the British and Irish cruise markets -- therefore all onboard announcements are in English -- with most passengers over 65 years old. Passengers are made up of retired couples and groups of friends, who seemed perfectly content to stroll around the ship as it sailed or nestle into a quiet corner without fuss. We didn't spot any solo travelers on our cruise, though Riviera Travel offers a limited selection of standard cabins on the lower deck for single occupancy, without a single supplement fee. There is no official dress code and the ship's crew advise passengers to dress however they feel most comfortable, whether that be in a dinner suit or relaxed slacks or jeans and shirt combination in the evening. Passenger attire leans toward informal. Expect jeans or trousers with shirts, polo T-shirts, sweaters and sturdy walking shoes during the day. In the evening, the casual theme continues, with chinos, smart trousers paired with polo shirts or shirts for men and smart two pieces or dresses for women. Some men do opt to wear a jacket and tie, although it's not compulsory. We didn't spot any women wearing cocktail dresses on our cruise, though you wouldn't look out of place if that's your preference. If you're cruising during the cooler months -- and even in summer when mainland Europe can experience bouts of rain -- pack warm clothes for when it gets cool on deck and you're taking in the scenic river views. 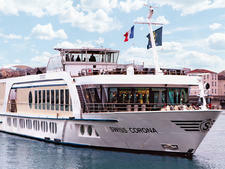 Riviera Travel includes return Eurostar or flight connections to your embarkation port; return coach transfers from the airport or train station to your ship; all meals onboard; shore excursions are included in ports where excursions are offered, which typically includes a one-hour walking tour; and a basic Wi-Fi package is also included. Drinks -- with the exception of tea and coffee -- and gratuities are not included in your cruise fare. For gratuities, an envelope is left in your cabin at the end of your cruise and the amount you leave is entirely up to you. It's advised to tip tour guides and coach drivers, too. 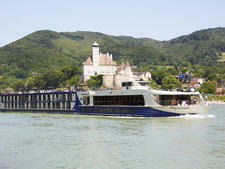 Although the ship is specifically targeted to the British cruise market, the onboard currency is the euro. 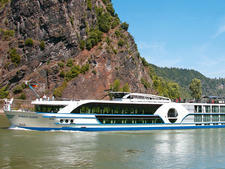 It is possible to combine one of Riviera Travel's land-based tours with a river cruise, though additional land-based travel is not included.